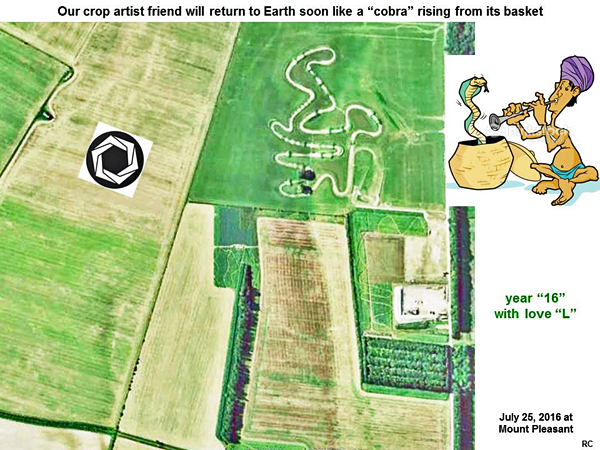 Will our crop artist friend return to Earth soon like a “spinning boomerang”, then rise up like a “cobra from its basket”? These slides are intentionally humorous, but then so was the crop picture! This crop circle conveys the same information as GBR (06/06/29), pg. 118. Instead of one straight line for each trajectory of the six impacting comets, this circle contains two broken lines, suggesting the more realistic curved path. The dark central hexagon is frequently used for the six comets A through F. The larger light hexagon is a circle of damage/destruction. See the pages in the free ebook at http://theheckhypothesis.com/aboutthebook.html. - the date June 14, 2017, 9 × 6 × 6 = 324 days ahead in the future; on this date, the horoscope shows two perfect triangles, like the hexagon. - 441 tuns = 441 × 360 days = 6 × 6 × 6 × 105 (= 216 × 105) weeks. 440 tuns link the annular eclipse on February 26, 2017 with the total eclipse on June 19, 1583, very short after the introduction of the Gregorian calendar in 1582. 441 tuns links the introduction date of the Gregorian calendar (October 15, 1582) with June 16, 2017, just two days difference with the abovementioned reference. Note that the time span of 105 weeks is just slightly longer than 2 years and almost exactly corresponds with 2 times the synodic cycle of Neptune (367.5 days): this means that each 105 weeks connect two dates with the same position of Neptune relative to the sun (a square). This repeats itself 216 times. In fact, the sun, the moon, Mercury, Venus, Jupiter, Neptune and the lunar nodes will have an approximate equal position relative to each other on June 14, 2017, compared to October 15, 1582! The crop circle formation and the tram lines are orientated towards sunset in June. The formation shows again that the introduction of the Gregorian calendar in 1582 had a divine inspiration (on a conscious or subconscious level): it also meant the start of a new epoch, which will end between the annular eclipse of February 26, 2017 and June 14 (or 16) 2017. The boomerangs suggest that whatever was created during the time in between will return to us. The nearby motorcross track symbolizes the connection of the beginning with the end, rather than our illusionary concept of linear time. 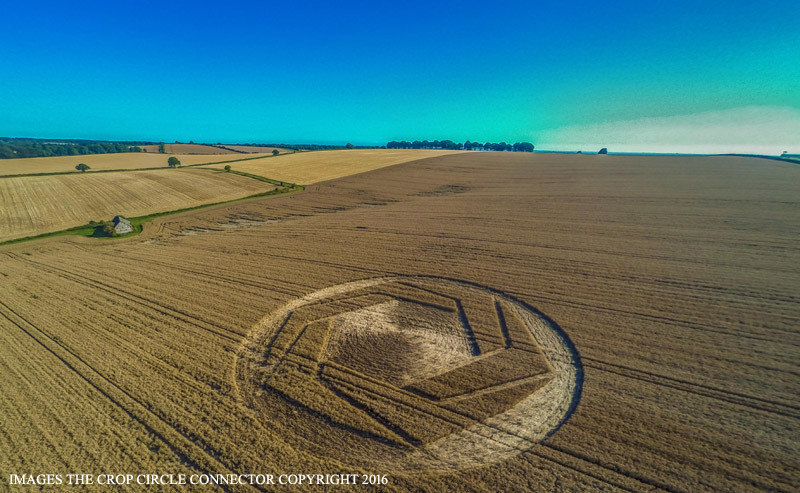 Crop circle from 25th July 2016 at Mount Pleasant, nr Cheesefoot Head, Hampshire. According to the Mayan calendar, 25th July 2016 is a day with the Solar Seal “White Mirror” and with Tone 10, in the Central Green Castle of Enchantment with major energy “Yellow Human”. On the crop circle are depicted 6 figures and each figure resembles a boomerang. Each thought, each word is like a boomerang, which we send to the Universe. And the Universe is like a huge MIRROR and sends this boomerang back to us, helps us to materialize our thoughts and words. The 6 boomerangs are placed on a big bright circle, which depicts a MIRROR and symbolizes the energy “WHITE MIRROR”. The location of the crop circle - Matterley Basin – is chosen not by chance. The Universe is like a huge “Basin” of “Matter”, of conscious energy, and can materialize our thoughts, dreams, wishes, intentions etc. 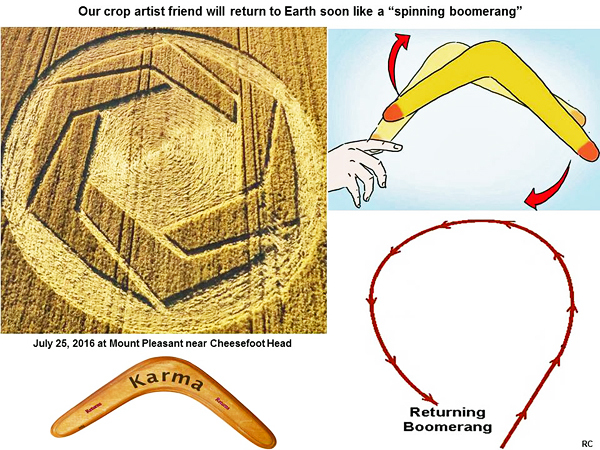 On the crop circle each boomerang has 2 parts, which looks like stretched arms. On this way is depicted the energy "BLUE HAND". The 6 boomerangs have 12 “arms” in total. Here the number 12 symbolizes the energy “YELLOW HUMAN” – Solar Seal No. 12. The boomerangs represent the Humanity: people with stretched arms to each other. The number 6 symbolizes the energy “WHITE WORLDBRIDGER” – Solar Seal No. 6. Each “arm” is like a bridge, built to the other people. On the crop circle is depicted an exciting image of the united Humanity: the people are with stretched arms to each other, they build bridges to each other. The people on the Earth have chosen to live in peace, instead of throwing boomerangs to each other. They have understood that each boomerang (each thought, each word) comes back to us. And when we throw to the other people negative thoughts and words, they like a boomerang with a sharp beak come back and injure us. This is the principle of the REFLECTION, of the MIRROR. Each boomerang has 5 sides. Or the number of the sides of all 6 boomerangs is 30. And the number 30 symbolizes the energy “WHITE DOG”. Kin 30 in the Tzolkin calendar is with Solar Seal “White Dog”. The people are united through the Energy of Love! And when we live in Unity and Love, each human feels strong: the energy “Red Serpent” means Life Force, Life Stability. Profound gratitude to the authors of this inspiring crop circle and to the photographers! !